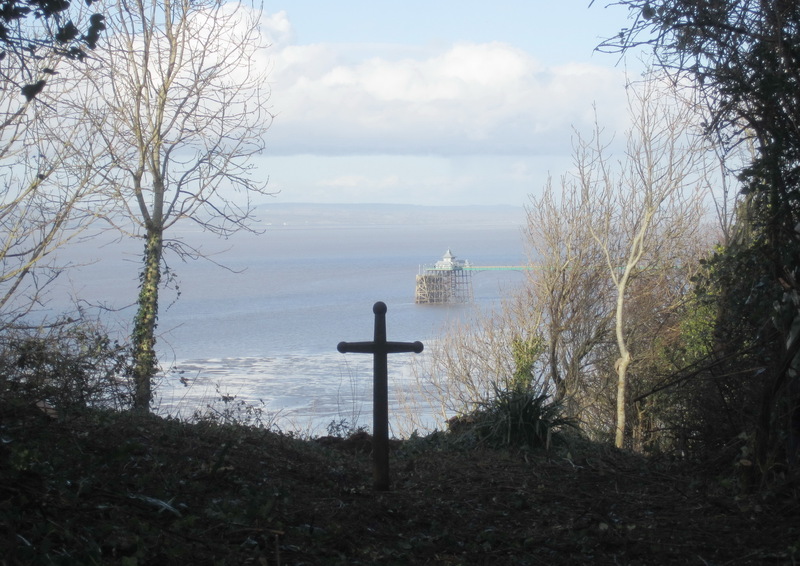 Working with North Somerset Council since September 2011, the volunteer group, Friends of Poets’ Walk, have been busy reinstating lost paths and opening up view points on Church Hill. 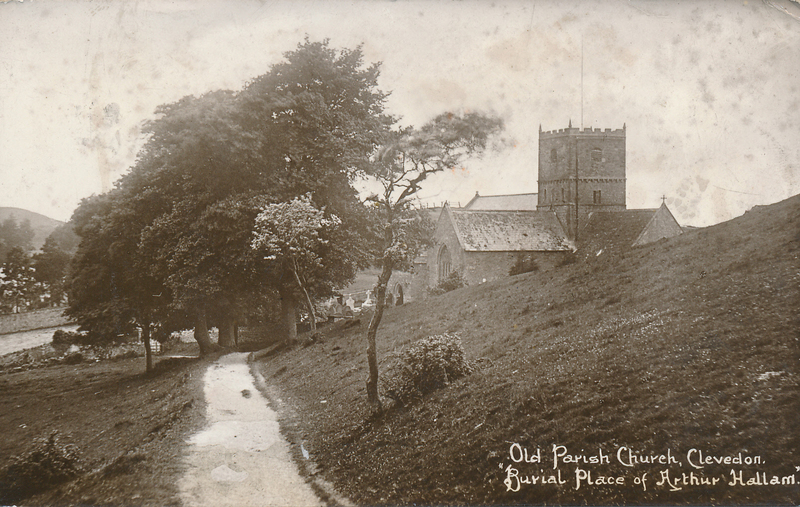 The first public footpath across Church Hill, which was long owned by the Elton family and variously known as Salthouse Hill, Poor Hill and Old Church Hill, ran across the front of the hill and was the way to the Old Church of St Andrew, avoiding the dirt of the farm road below. It originally led off Old Church Road and ran uphill beside Hack’s Cottages. The first section that we know today, which leads off Salthouse road opposite the carpark, was opened later and is shown on a map from c. 1883 (photo right). 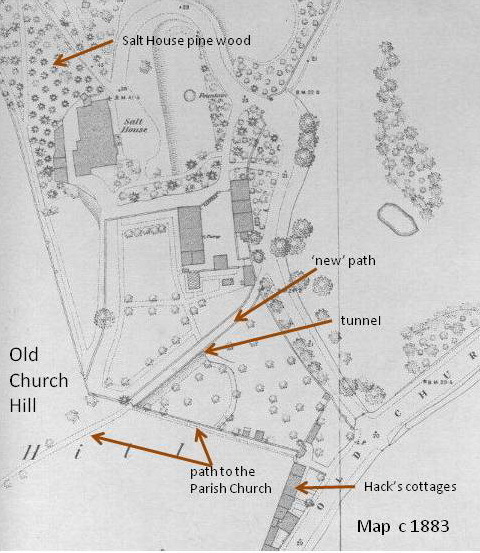 The then owner of the Salt House had a tunnel built under the path to enable him to reach the part of his property now otherwise cut off. 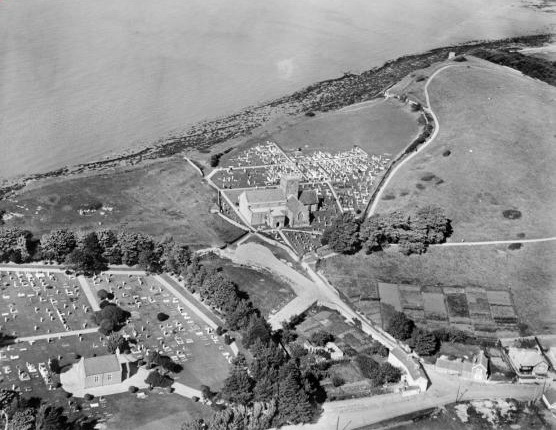 The popular coastal path around Church Hill and Wain’s Hill along with the section between Church Hill and the cemetery, together known as Poets’ Walk, was constructed in 1929 in conjunction with the creation of the Marine Lake. 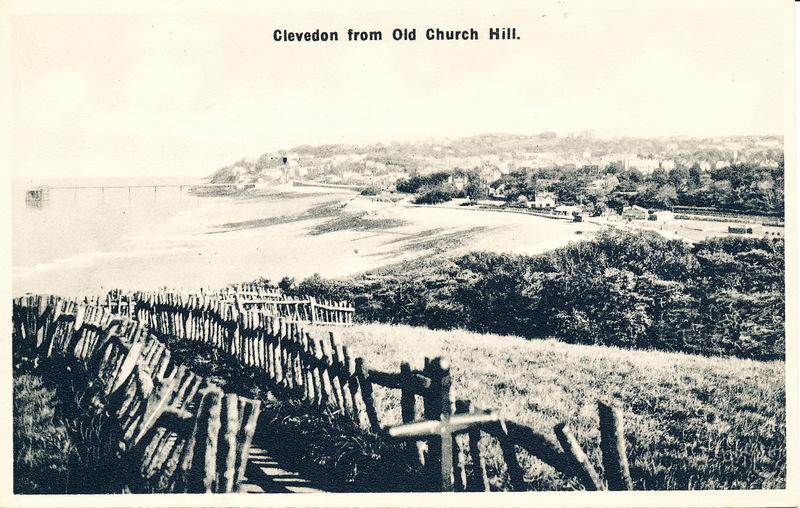 An earlier, now largely forgotten circular walk round Church Hill had already been laid out in 1923, serving to provide local employment in the economic depression and to offer visitors easy access to the top of Church Hill with its stunning views over Clevedon to the Mendip Hills and the Bristol Channel to Wales. At that time both hills were fenced and grazed by cattle and sheep so that the grass remained short and there was only the occasional hawthorn or elder tree to interrupt the view. Branching upward from the well established path from the Old Church across the southern flank of Church Hill, the route of this new path took the visitor to the hilltop and then curved anticlockwise around the hill before descending gently to the path that runs behind the churchyard wall (photo left). The broad path was cut into the hill to make it level, and surfaced with stone chippings, probably from the Old Church Hill quarry. It slowly became grassed over, but would still have been in regular use until brambles and scrub – and even trees – finally took over as a combined result of the cessation of grazing in the 1940s and the decimation by disease of the rabbit population in the 1950s. A section of the same 1923 gravel path is clearly shown on an aerial photograph from 1928 (photo left) and can be seen on several old postcards. The entire route is marked on a map from the 1970s. Only the south-facing section is indicated on North Somerset Council maps today and it is this stretch that the Friends of Poets’ Walk uncovered first, removing scrub and cutting a corridor through secondary woodland. The entire route has now been reinstated and is maintained on a regular basis. From the section running above and behind Salthouse Court flats walkers can glimpse Marine Lake through the trees. The west-facing section runs close to the top of the wide, stone steps that overlook the churchyard and provides a welcome alternative to clambering up or down a steep and often muddy slope. 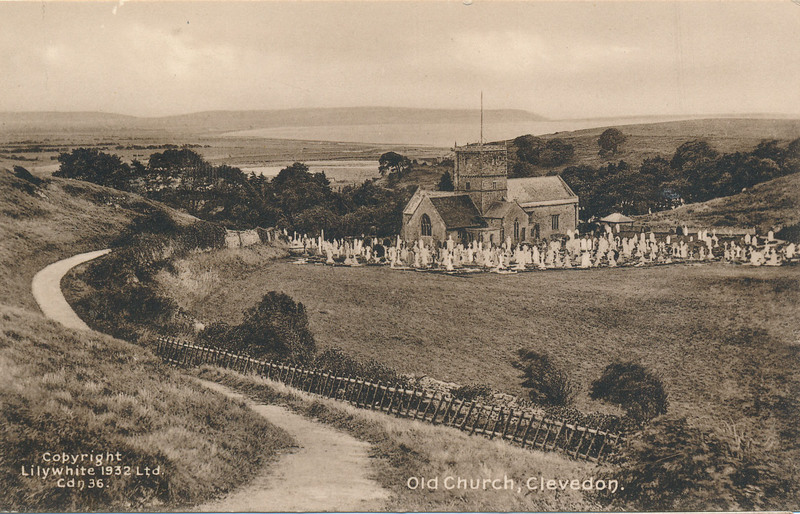 In the 1950s Church Hill was still mostly grassland with only a narrow strip of bramble cover above the allotments that border Old Church Road. But in the absence of grazing vegetation grew unchecked and the scrub gradually engulfed the grassland, moving upward from the allotments and hiding the path and the seat that had previously provided a splendid view over Clevedon to the Mendip Hills. 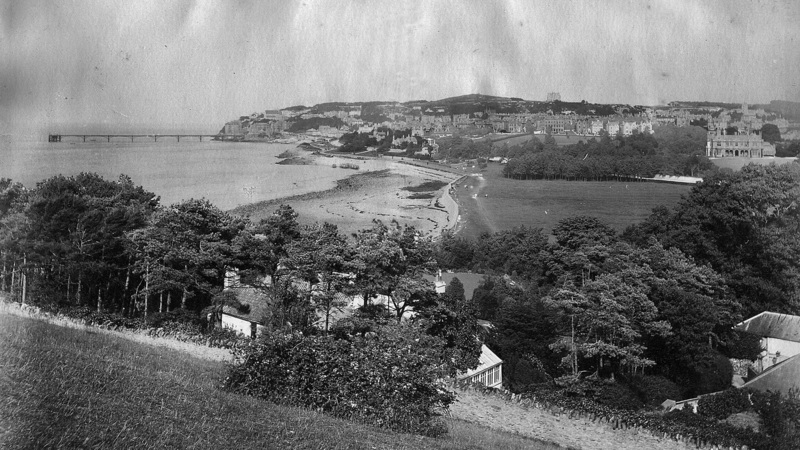 Photographs taken in the 1890s show that before the Marine Lake was made and Poets’ Walk laid out there were no trees and virtually no scrub behind the Salt House wall (photo left). Inside the wall was the private Salt House pine wood. The wall, now largely collapsed, was originally continuous from Old Church Road to the castellated cliff-top lookout that was built c. 1835 at the north-west corner of the Salt House property. An arched gateway in the wall close to the lookout (which was restored in 2005 and is commonly known as the Sugar Lookout) led out onto the hill. 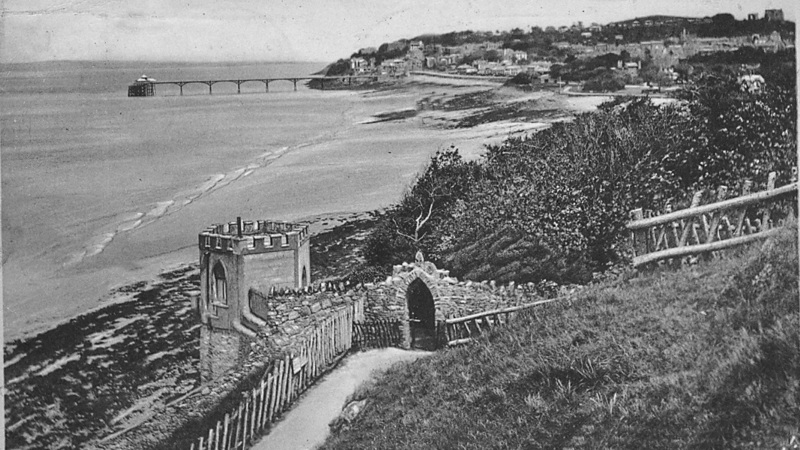 In 1929 this arch was incorporated into the newly made Poets’ Walk (photo below) after the Salt House wood and a strip of access land had been sold at valuation to the Council by the new owner of the Salt House property, the visionary Mr Nutting, initiator of the Marine Lake. 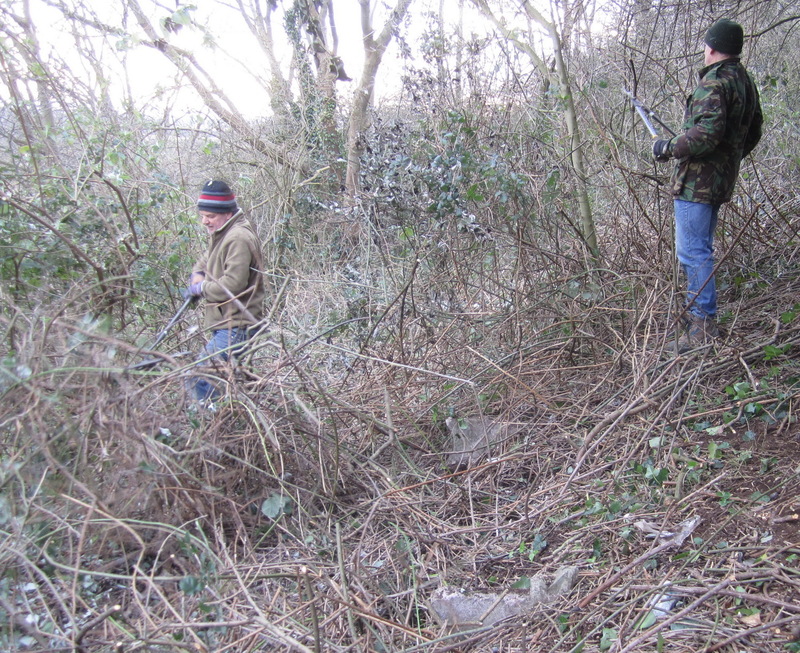 Four winters ago the now popular Church Hill zigzag path, which leads up from Salthouse Woods near the Sugar Lookout, was but a memory, having become lost under scrub in the last few decades. Since uncovering the stepped and metalled path, the volunteers have opened up a broad, grassy plateau above, rediscovering the iron cross bollard that marks the top of the zigzag. This is now possibly the best view point of all from Church Hill. The zigzag path was probably created shortly after the opening of Poets’ Walk in 1929. 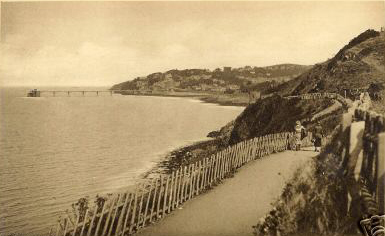 A mid 1930s photograph (photo right) shows it bordered on both sides by a rustic fence similar to that erected along the coast path, the fence and bollard presumably serving to prevent cattle wandering onto the path. 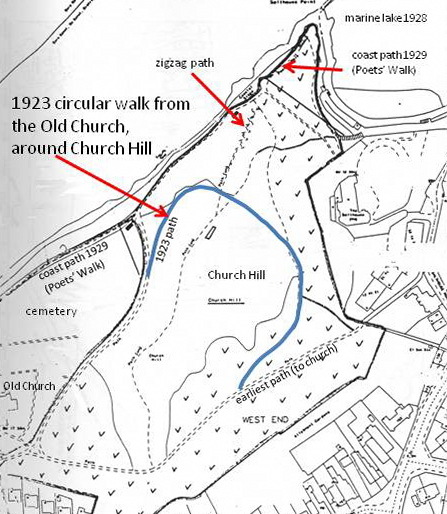 All the paths of Church Hill can be found on the map in the recently published Friends of Poets’ Walk Guide to Footpaths and Features. Thanks! We hope that lots of people will use the restored paths so that they remain open.